The next editions of Untitled will take place on the beach at Ocean Drive and 12th Street in Miami Beach, FL, December 6  10, 2017; and at 420 22nd Street, Pier 70, in San Francisco, CA, January 12 - 14, 2018. SAN FRANCISCO, CA.- On Sunday, January 15, Untitled, San Francisco closed its inaugural edition with reports of steady sales and an enthusiastic response from participating international galleries, collectors, curators, art professionals, and the general public. 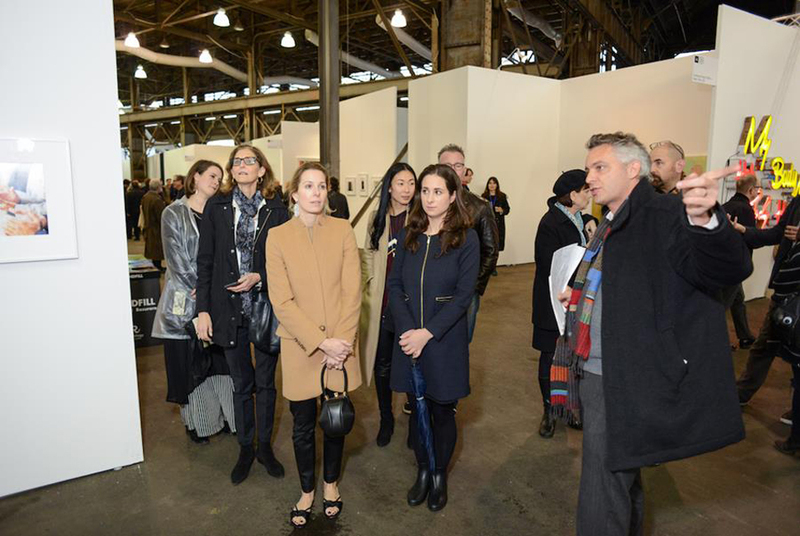 The debut of Untitled, San Francisco marked its position as a must-attend event backed by strong support from the Bay Area community, confirming San Francisco as a destination city on the global art fair circuit. Untitled, San Francisco continued the fairs unique curatorial vision, showcasing leading international exhibitors, special collaborations with outstanding Bay Area institutions, non-profits and artist-run exhibition spaces, the new Untitled, Monuments sector, which presented large-scale, site-specific works, and the return of the popular Untitled, Radio. Across four days, the fair attracted esteemed collectors from the Bay Area and around the world including Shelley and Phil Aarons, Alka and Ravin Agrawal, Joachim Bechtle, Frances Bowes, Dolly Chammas, Roselyne Chroman Swig, Susan Swig, Penny Cooper and Rena Rosenwasser, Carla Emil and Rich Silverstein, Nancy Forster, Marjory Graue, Katie Harbin Clammer, Ann Hatch, Michael Xufu Huang, Kaitlyn Krieger, Mihail Lari, Paul Leong, Cynthia Loukides, Larry Matthews, Nion McEvoy, Ellanor Notides, Deborah and Andy Rappaport, Mera and Donald Rubell, Robert Shimshak and Marion Brenner, Katie Paige, Hong-gyu Shin, Danny and Manizeh Rimer, Komal Shah, Norah and Norman Stone, Abigail Turin and Jon Gans, Carlie Wilmans, Robin Wright, Sonya Yu and Zach Lara, and Tiffany Zabludowicz, among many others. Curators and art world professionals were also among the guests at Untitled, San Francisco, including Nora Abrams (MCA Denver), Lele Barnett (Microsoft Art Collection), Steve Beal (CCA), Janet Bishop (SFMOMA), Tom Decainy (San Francisco Arts Commission), Aebhric Coleman (Kramlich Collection), Apsara DiQuinzio (BAMPFA), Jennifer Dunlop-Fletcher (SFMOMA), Rudolf Frieling (SFMOMA), Gary Garrels (SFMOMA), Jenny Gheith (SFMOMA), René de Guzmán (Oakland Museum of California), Caren Gutierrez (Asian Art Museum), Cheryl Haines (For-Site Foundation), Max Hollein (de Young Museum), Anthony Huberman (The Wattis Institute for Contemporary Arts), Anastasia James (Contemporary Jewish Museum), Maria Jenson (SOMArts), Connie Lewallen (BAMPFA), Mia Locks (2017 Whitney Biennial), Sharon Maidenberg (Headlands Center for the Arts), Tom di Maria (Creative Growth Art Center), Leigh Markopolous (CCA), Kate MacKay (BAMPFA), Hesse McGraw (San Francisco Art Institute), Sandra Phillips (SFMOMA), Renny Pritikin (Contemporary Jewish Museum), Carolyn Ramos (Artadia), Larry Rinder (BAMPFA), Lucía Sanromán (Yerba Buena Center for the Arts), Susan Sayre Batton (San Jose Museum of Art), Claudia Schmuckli (de Young Museum), Bennett Simpson (MOCA Los Angeles), Lori Starr (The Contemporary Jewish Museum), Ari Wiseman (Solomon R. Guggenheim Foundation), Dominic Willsdon (SFMOMA) and Vincent Worms (KADIST), among others. Well known advisors who guide some of the most important collections were also in attendance including Artsource Consulting (Kerri Hurtado, Jody Knowlton and Tessa Wilcox), Jennifer Biederbeck (Sothebys), Sabrina Buell and Zlot Buell Associates, Ashley Carr and Suzanne Modica (TWAAS), Ellanor Notides(Christie's), Tracy OBrien, Joelle Connelly, Lauren Ford, Laura Sweeney, and Luiza Teixeira de Freitas, as well as other notable guests including Dodie Bellamy, Vincent Fecteau, Dan Fox, Stanlee Gatti, Brad Kahlhamer, Kevin Killian, Paul Kos, Pamela Lee, Barry McGee, Trevor Paglen, Clare Rojas and John Waters. The curated fair featured exhibitors from 10 countries including Galerie Perrotin, Andrew Kreps Gallery, Galerie Balice Hertling, Overduin & Co., PROYECTOSMONCLOVA, Hannah Hoffman Gallery, Instituto De Visión, and Anglim Gilbert Gallery. The inaugural edition of the fair brought together galleries from 19 vibrant cities including Berkeley, Berlin, Bogotá, Buenos Aires, Chicago, Frankfurt, London, Los Angeles, Madrid, Mexico City, New York, Oakland, Oslo, Paris, Saint-Ouen, San Francisco, Sausalito, Stavanger and Tehran. The inaugural San Francisco fair also saw the debut of Untitled, Monuments, an exciting new sector that utilizes the fairs unique, industrial space at Pier 70. Untitled, Monuments, 2017 presented a selection of large-scale, site-specific works of art by established and next generation artists including Ann Iren Buan (Projektrom Normanns), Parker Ito (Château Shatto), Goshka Macuga (Andrew Kreps Gallery), Jared Madere (David Lewis), Ugo Rondinone (BAMPFA), Amba Sayal-Bennett (Nathalie Karg Gallery) and Leo Villareal (Sandra Gering Inc.). As part of its curatorial ethos, Untitled integrates not-for-profit and artist-run exhibition spaces into the overall layout, positioning artworks and artists in direct dialogue. In San Francisco, Untitled collaborated with an array of outstanding regional institutions and non-profits including UC Berkeley Art Museum and Pacific Film Archive (BAMPFA), The 500 Capp Street Foundation, Contemporary Jewish Museum, Creative Growth Art Center, Headlands Center for the Arts, The Fine Arts Museums of San Francisco, The Lab, San Francisco Cinematheque, Yerba Buena Center for the Arts and The Wattis Institute for Contemporary Arts. Untitled, San Francisco presented a dynamic programming of artists projects, workshops, and performances. Highlights included The 500 Capp Street Foundations Dumbball making workshopa ubiquitous David Ireland sculptural series; The Wattis Institute for Contemporary Arts temporary bar on-site at the fair inspired by their own Oscar Tuazon designed Wattis Bar, that also served as the hub for Untitled, Radio; The Lab, who along with Oakland-based artist Constance Hockaday, presented Attention! Weve moved, a floating performance and exhibition space installed onboard a boat; daily performances from the Headlands Center for the Arts with artist-in-residence Brent Green; the TOILETPAPER lounge, an artistic collaboration between celebrated artists Maurizio Cattelan and Pierpaolo Ferrari; Ann Hamiltons large Welcome Mat, presented by Workshop Residence; performances by Arash Fayez, presented by the Yerba Buena Center for the Arts Live Practice program; a curated exhibition of materials drawn from the extensive archive of SF Cinematheque, intended to open a conversation between experimental film and the visual fine arts; and a curated video program, A Light Shines Through, presented by Ashley Carr & Suzanne Modica. The first edition of the fair also saw the return of the popular Untitled, Radio, streamed on Radiooooo.com, and produced in consultation with Oakland-based community radio station, KGPC 96.9 FM. Untitled, Radio presented an extensive daily program of discussions, readings, performances, and sound works. Untitled, Radio takes the place of the customary fair program of talks, interviews, and roundtable discussions. Encapsulating the fairs ethos of inclusivity, the radio station brings together artists, curators, and institutions from around the world, and is recorded and archived on Untitleds website, which remains accessible throughout the year. A full archive of the weeks programming is available on www.art-untitled.com. In keeping with Untitleds mission to provide a dynamic fair experience for visitors and exhibitors, Untitled, San Francisco engaged with several exceptional local businesses. Mod, a serviced business lounge concept for professionals working on the go, provided a lounge with conference rooms, massages, and coffee by FRONT, a San Francisco-based coffee concept, who also provided exhibitors and visitors with snacks and coffee in the main section of the fair. Culinary fixtures in the San Francisco food scene Tartine and Del Popolo also had pop-ups at the fair, providing delicious food options. Untitled, San Francisco was championed from its inception by a number of ardent supporters from the Bay Area including Artsource Consulting (Jody Knowlton, Kerri Hurtado, and Tessa Wilcox), Artadia, Anglim Gilbert, Berkeley Art Museum and Pacific Film Archive, The 500 Capp Street Foundation, California College of the Arts, The Lab, Minnesota Street Project, Mod, The Wattis Institute for Contemporary Arts, Headlands Center for the Arts, Workshop Residence, SF Arts Commission, Yerba Buena Center for the Arts, and many others. Untitled, Art has garnered a reputation for its commitment to creating an architecturally-designed and visually-dynamic environment for the fair. This approach continued in San Francisco with Untitleds commission of the award-winning San Francisco-based firm Ogrydziak Prillinger Architects (OPA), who have been recognized for their designs for private residences, institutions and a collaborative site-specific installation with James Turrell in Sonoma County. Detroit Institute of Arts welcomes a two new "guests of honor"
Massimo De Carlo, Hong Kong opens its first group show "Between Utopia and Dystopia"